A multi-million pound plan to redevelop a "significant" site in an historic East Yorkshire town is being debated at a public inquiry. Developers want to build shops and offices on land in Flemingate, Beverley, the former site of a chemical works and an Army transport museum. Under the proposals, East Riding of Yorkshire College's Beverley campus would also move to the new site. The plan was referred to the government because of the scale of the project. 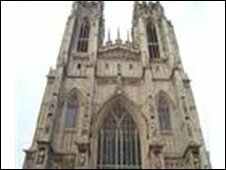 East Riding of Yorkshire Council has approved the development, which would be built opposite Beverley Minister. But Hull City Council has objected to the scheme saying it would undermine regeneration efforts in Hull city centre. Councillor John Robinson said: "The council objects to the planning application due to the scale of retail and office development proposed and the adverse impact this may have on Kingston upon Hull." An East Riding of Yorkshire Council spokesman said the majority of residents were in favour of the development.